16 x 16. Tangerine by hunterw. Now with 100% less crashing in loading screens! Excellent mixed map that hovers can be really dangerous on. 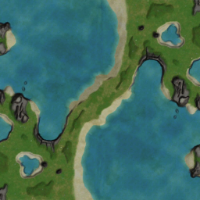 It has many Geo plant spots - It's the right map for many players. I wonder why there's no version with more metal in the center, including the east and west sea parts. Would make for more aggressive gamepl0y. 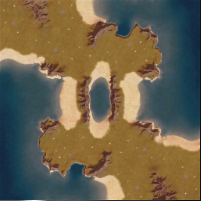 It's a particularly frustrating map in team games when you're a land fac trying to push down the centre beaches and whoever you have at sea fails to contest the opposition for it so you get lanced and envoyed to death, but on the other hand, because the land bridge is wide and hilly, you do have another chance to get it right as left sea cannot influence the battle on the right and vice versa. A more verdant version would be nice to look at though. As far as I am aware this changes nothing.